why would you deform your baby?? strangely resembles that crystal skull from the Indiana Jones movie...coincidence? To me it resembles the 'aliens' from the last Indiana Jones movie. I agree with the people who think they look like the skulls from Indiana Jones. "I want to know. I want to know!" Oh it's Indiana Jones in real life! Except global... That is weird. I think they reshaped the skulls. It's not a very nice thing to do.. FASHION? Now that's too much for fashion! Poor kid! MCCINCOL and DAME ORCHID and TRAVELING GNOME: I watched Indiana Jones just recently, and it DOES look like that skull!!!!! Dame Orchid: I love that movie too! Wow. I'm going to say that it is probally not human. Mabey it's an ancestor of a human? Like Lucy is? They evolved that way, and then discovered that having a cone shaped head really isn't all that great for balance, and died out. Who knows? 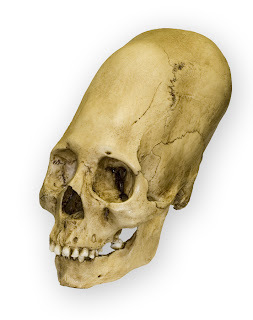 To people who think it looks like the Indiana Jones skull: Mabey they based the movie scull off of this one. I wonder if they could run some sorts of DNA tests on those?? (or are they too old? I don't know much about that stuff) That would be cool....and what would the results look like if they're not human? I read that people in the Amazon put boards on their kids' heads to make them the shape of jaguar heads. And hung stuff between their eyes so they'd be cross-eyed. All because it was 'attractive'. Gag. Since when did these people have cheese posing as brains? Duh, you don't HAVE to be fashionable. It's like asking someone: "So let me get this straight? I can break into any building I please, I can wrestle you down to the ground in seconds, I can even catch crooks. But that dosen't matter as long as I have a giant skull?" Cause, face it, I don't want people deforming me! I can put my legs behind my head all on my own! I don't need strange-looking body parts to join the circus, you know. How would one deform a skull /that/ much? Wow...it's like the burial ground for the predecessor of P.T. Barnum's midget colony!! it looks like homer and bart simpson! Patsee: while the kid is still young they tie two boards onto the top and bottom of the head because at that point, the skull is still pliable. It looks exactly like in Indiana JOnes---freaky coincidence?????????? Ooh, the Kingdom of the Crystal skull!! Espionage: I know, but it's really really long. I know you can flatten out your forehead by tying boards to it, but this seems like a lot more than that. Wow. I've heard of the Mayans doing that, But in Siberia? That's weird. It really does look like an Indiana Jones skull! Like in the new Indiana Jones movie! hmmm, thats really weird ( but serectly awsome!) it kinda freaked me out, but luckly my inhaler was there by my side! ( jk, i dont really have azma!) lol, i hope thts not my great great great great great .... .... ... ..... .. . . . . .. . .. . .. . . . . . . . . . . . . . . . . . . . . . . . . . . . .. . GRANG FaTHEER! What people do to look young. Depressing. Yeah, there are the flat head indians who tied rocks to their babis heads so that they would be flat (hence the name.) I don't actually know their name for themselves, but I have heard a lot about them. Didn't the guy in the video talk about extended brain capabilities? Like predicting the weather and stuff.